Stock photo of a red fishing stage in the town of L'Anse aux Meadows, Northern Peninsula, Great Northern Peninsula, Viking Trail, Trails to the Vikings, Newfoundland, Newfoundland Labrador, Canada. 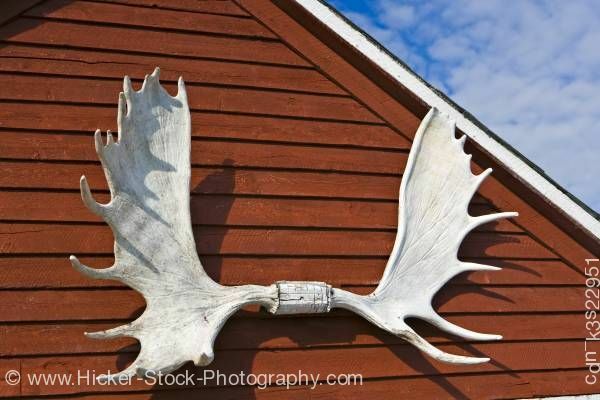 A set of moose antlers are mounted to the fishing stage in the town of L'Anse aux Meadows. This stock photo shows a closer view of the red fishing stage in the town of L'Anse aux Meadows, Northern Peninsula, Great Northern Peninsula, Viking Trail, Trails to the Vikings, Newfoundland, Newfoundland Labrador, Canada. A close up view of the fishing stage building shows deep red wood slats that is part of the peaked roof. Attached to the building is a set of moose antlers. The large white antlers have a slight curve and have many prongs at the sides. Some of the prongs are very long. Veins or thin grooves can be seen throughout the antlers. The shadow of the antlers reflects on the red fishing stage. The right corner shows a small patch of the puffy white clouds.